A compact landscape area on the north side of the River Tywi which has been occupied since at least the Iron Age, and has always contained at least one high status holding. The area lies between the river and the Tywi Valley Roman road (see Area 191), and is dominated by Grongaer Hill and its large Iron Age hillfort, which may have been the centre of a large territory covering all of Area 192 and beyond. During the historic period most of the area lay within the southern half of the commote, and later hundred, of Cetheiniog (Rees 1932), held of the independent Welsh lordship of Cantref Mawr until the establishment of the county of Carmarthen in 1284. The hillfort may have continued to influence prestige and tenurial patterns into the Medieval period. 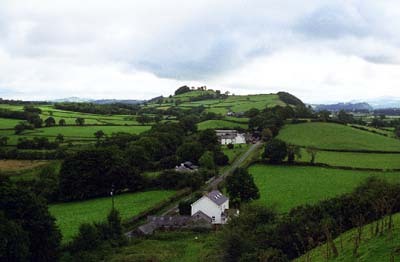 The Medieval Lordship of Allt-y-gaer, centred on Cwm Agol to the south of Grongaer Hill, possibly evolved from a pre-Conquest estate held as a maerdref or under similar, or communal tenure (Owen 1892). A second high-status Medieval site, later a possession of the Golden Grove estate, lay at Cilsan to the east (Jones 1987, 32). The nearby Berllan-dywyll may also have Medieval origins (Jones 1987, 8). The area moreover contains the church of St Cathen, Llangathen, which may have pre-Conquest origins (Ludlow 1998) and is the centre of a large parish of some importance, as reflected in its size, although it is not accompanied by any significant nucleation. By the late Medieval period, however, a further high status dwelling had been established at Aberglasne immediately east of the church (Jones 1987, 2). It was acquired by Bishop Rudd of St Davids c.1600 and was later the home of the Dyers, one of whom, John Dyer, composed his famous poem 'Grongar Hill', an early celebration of the Romantic, in 1726 (Andrews 1989, 79). A small area of parkland landscape accompanies Aberglasne House, and the environs of Cilsan have been remodelled along 'polite' principles. The comparative regularity of the medium-large fields in the remainder of Area 192 suggests enclosure within the 16th-17th centuries. Llangathen village developed under the patronage of the Phillipses of Aberglasne during the 19th century. It has remained small, despite the development of a later 20th century housing estate. 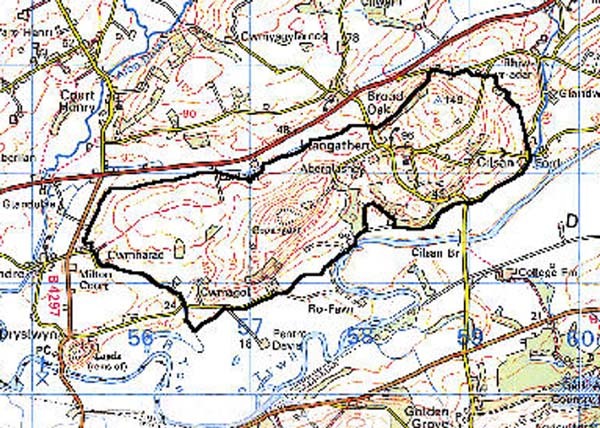 Llangathen character area consists of two low hills with the village of Llangathen and Aberglasne house and gardens nestling in the saddle between them. The hills rise steeply from 20 m OD from the flood plain of the Tywi to a maximum of 143 m. All the farmland is enclosed and divided into small- to medium-large irregular fields and is under a regime of improved pasture. There is very little rushy or rough ground. Boundaries are earth banks topped with hedges. Hedges are well maintained on the lower slopes, but neglected and derelict at higher levels. Indeed, the hedges on the summits of the hills are now entirely broken down and the land here is taking on an unenclosed appearance, although here, as elsewhere, wire fences provide and or supplement older boundaries. Distinctive hedgerow trees are present, particularly close to Aberglasne, and these, together with stands of woodland on steep hillsides and the hedgeless hilltops, lend a parkland aspect to the landscape. Farms are dispersed, but concentrated on the south-facing slopes overlooking the Tywi valley. Farmhouses are generally of late 18th- and 19th-century date. The settlement at Llangathen, centred on the Medieval church, comprises a loose cluster of 19th century farms and houses and 20th century dwellings. Below the village lie Aberglasne house and gardens. The landscape area is dominated by the Iron Age Hillfort on Grongaer, while there is a possible round barrow and a possible further hillfort. Other possible archaeological sites include a moated enclosure at Cwm Agol and a holy well. Post-Medieval quarries lie south of Llangathen. Distinctive buildings include the Grade B listed Medieval parish church of St Cathen, Llangathen which has an early 17th century south aisle and chapel with a fine contemporary monument to Bishop Rudd. Aberglasne House is a Grade II* listed building and has early elements, but externally seems to be a three-storey house dating to the late 18th- and early 19th-century. Associated with the house are other buildings and garden features, including a gatehouse, former domestic outbuildings, a lodge, two courtyard ranges and two coach-houses, all individually Grade II listed (7 in all), walled gardens and a pond, and a Grade II* listed arcaded walk that dates to at least 1783. The house and gardens, entered as ref. number PGW (Dy) 5 (CAM) in the Cadw/ICOMOS Register of Parks and Gardens of Special Historic Interest in Wales (Whittle, 1999), are currently being restored. Associated with the house and Llangathen village are the half-timbered, early 20th-century Village Hall, a poorhouse, primary school and Post Office, while two nearby buildings are known as Bishop Rudd's bath and pigeon house. Further distinctive buildings within the village include the Farmers Arms public house, Hill House, a Post-Medieval chapel and the later 20th-century Gellinewydd housing estate. There is a Medieval - Post-Medieval fortified dwelling at Allt-y-gaer, and earlier Post-Medieval houses at Cilsan and Berrlan-dwyll. Farmhouses are stone-built with slate roofs, of two storeys and generally of late 18th- and 19th-century date with examples in the polite as well as the vernacular tradition. Farm outbuildings are stone-built and of 19th century date, some with a semi-formal arrangement. This character area is well defined to the south where it rises from the Tywi valley, less well to the north.